Do not send payment until I confirm! Please note I do not draw R-18 or gore. Please fill out the form and note or comment below. Once I accept your commission I will either send you an invoice from Paypal or set up a commission widget for you. 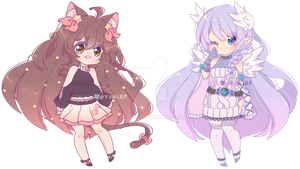 Regular Commissions [CHIBIS OPEN]Chibis are still on sale! Commission [Closed]EDIT: prices have changed. People on the waiting list are not affected by price changes. I am sorry I had to raise the prices, but I put a lot of work and hours in every single drawing.